Volkswagen Ameo, the German carmaker's most awaited sub-compact sedan was launched today in India at a starting price of Rs. 5.14 Lakh (ex-showroom, Mumbai). Marking the carmaker's first sub-4 metre sedan in the Indian market, the Ameo is touted by Volkswagen as a car the made-in-India and made-for-India. Currently the car will be available only in petrol variant, offered in three trim options - Trendline, Comfortline, and Highline all priced in the range of Rs. 5.14 lakh to Rs. 6.91 Lakh (ex-showroom, Mumbai, Pre-Octroi). The all-new Volkswagen Ameo will be powered by the company's efficient 1.2-litre MPI three-cylinder petrol engine that does duty in the Volkswagen Polo as well. The engine is capable of curing out a maximum of 74bhp and 110Nm of peak torque, while mated to a 5-speed manual gearbox. Although we believe a diesel variant of the car is also in works and will be launched at a later date, possibly after Volkswagen is done with the recall of diesel cars it recently issued in India. 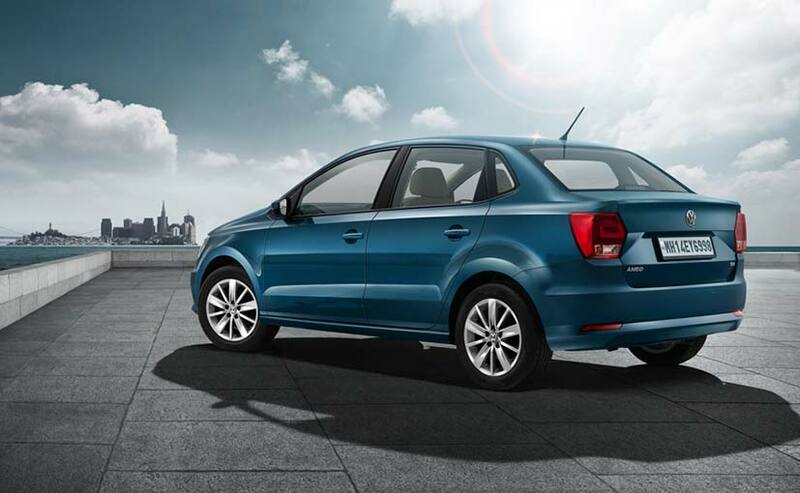 Based on the same design platform as the Volkswagen Polo, the new Ameo largely resembles its hatchback sibling. That said the car does come with a number of new styling cues and exterior features like - projector headlamps, new front bumper, horizontal fog lamps, new alloy wheels and an all-new rear profile. Volkswagen Ameo is also come with a host of new segment-first features that include - cruise control, rain sensing vipers, anti-pinch power windows, front arm rest, and Static cornering light. But that is not it; the Ameo is also equipped with some of the best creature comfort features like touchscreen multimedia music system with Mirror link, I-pod connectivity, phonebook / SMS viewer, automatic AC with dust & pollen filter, electronically adjustable ORVMs with LED turn indicators, cooled glove box, tilt and telescopic steering wheel, and rear AC vents. When Volkswagen introduced the Ameo earlier this year, the company has claimed that the car will set a new benchmark in safety standards in its segment. Staying true to its words, the company has equipped with best-in-class safety features like - driver and passenger airbags as standard, ABS as standard, and rear view camera with parking sensors. Launching the Ameo, Michael Mayer, Director, Volkswagen Passenger Cars India said, "Today is a very special day for Volkswagen in India, as we introduce our first ever made-for-India carline, Volkswagen Ameo. The Ameo underlines our philosophy of offering the best of technology and safety standards packaged at an attractive price. Through the Ameo, we are confident of cementing Volkswagen's strong presence in the compact sedan segment and further expand the Volkswagen India family."